Our release for FAIR is Ryan skin featuring hairbase and beard in brownish blonde. The shape is also available in five standard sizes. Please read the note in the demo pack in order to better fit the shape. Please remember that there is a join fee of 50L$ to join the group. Group rewards active on almost all the vendors. After months of tease the skin is finally out. And after hundred requests, the shape is available too. We are going to put out more shapes next week for the other skins as well, we hope that this will make you happy. Marilyn skin is available in 12 tones, from pale to dark (very dark) as always. Standard sizes in Male version and Female version. night, brick, grass, purple, orangered, teal. 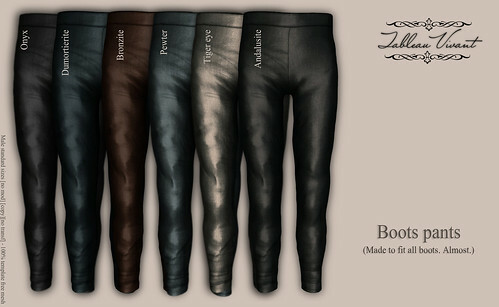 New release for FaMESHed: simple pants for boots. Skinny fitting, plain design to be worn under sweaters, jackets, t-shirts or shirts, with a minimum bulk around the waist and ankles, for a better boots suit.